In preparing for Fall 2016 I realized it looks a lot like Fall 2014 when The Pub Club was born. For those who have not heard the story and those who have forgotten, after multiple conference experiences I returned to MSU with this thought: “How great would it be and how much would our science improve if we could duplicate the excitement, the interactions, the networking, the science discussions, in essence “the conference effect,” back at MSU?” After two successful years, this summer I took “The Community of Minds” concept that The Pub Club represents “On The Road” to conferences with me. It was presented in many conversations, a poster and even a “Meet-up” at ASPB’s PlantBio16. Many expressed interest in bringing “the conference effect” back to their schools. So, this is written for those people, but also those at MSU who have seen personal benefit and wish it to continue and those who are new at MSU and would like the opportunity to benefit from the environment The Pub Club represents. It is written for those who have forgotten how it started and those who don’t know where to start. For the few who will choose to lead and the many more who will simply follow. The first meeting of The Pub Club was quite literally me sitting at a table in the 4th floor “living room.” I spent the first September talking to people about The Pub Club idea and asking them to participate. I also built the first version of “The Hub,” The Pub Club website. The first several posts reflects the efforts being made every week on the 4th floor to get “the conference effect” started. The first post Oct 13th was “A Little Help…” It consisted of these 2 lines: “Is there a snack, appetizer, or treat you make really well? Leave a comment here if you are willing to make it for one of our weekly gatherings. If not but have something you think would be good please let us know your idea.” The second post was “Who do you like…”, this Oct 14th post included a request for names of guest speakers individuals in the group would like to hear from. Also included in the post was a list created at the previous Friday Gathering. The next post “Offer a Topic…” may have set a record for the shortest post ever, it simply said: “Please take a minute to leave a comment with any topics you would like to see addressed or discussed in future gatherings.” This was followed Nov 14th with a post, “Favorite Pubs,” asking members to share their favorite published articles so they could be added to the new “Favorite Pubs” page of The Hub where all could share. Dec 5th brought “Image Request!” and was followed Jan 5th with “Spring Mug Club Nominations”. The Pub Club is a “voluntary” experience. While the benefits it offers require “active participation,” as stated in the summary of the “Mission Statement,” no one is required to attend. The reason for pointing out the posts of the first semester of The Pub Club is to show that every effort in the beginning was to get members to participate and even more to get members to take “ownership” of the opportunity. The truth is that these posts went almost completely unanswered. While membership grew, the “ownership” did not. Every week it was necessary to walk the floor just before our Friday Gathering began and get people away from their “bench” or desk to attend. While members always enjoyed the experience, they were yet to understand the benefit of “The Community of Minds” vision. Once there they would discuss their science, express their frustrations and grow their Community. The top example was our Nov 21, 2014 gathering with Mug Club’r Dr. Beronda Montgomery who “talked with us about priorities, expectations and balance.” in our “careers.” (see meeting summary here) The members got so much out of this discussion that they requested more on this topic, resulting in multiple future gatherings continuing the discussion started here. Still the weekly “siren call” remained necessary. While any “fly on the wall” could see the immediate benefit this one hour a week produced for participating members, the “extracurricular” view is deeply embedded in the science student psyche. Want evidence? By the end of the Fall 2015 semester, weekly attendance regularly topped 25 members. Also, read “A Letter from the founder” written at the end of the Spring 2015 semester, and, for a personal account, read “Was It Worth It?” by former Python Group coordinator Katie Wozniak after she graduated MSU. More? 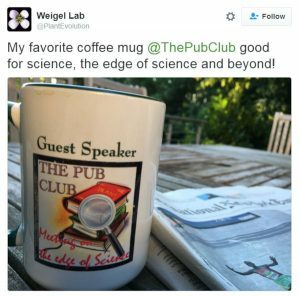 We are honored to have Mug Club’r Dr. Carl Rhodes, a retired senior scientific officer at the Howard Hughes Medical Institute (HHMI) return to participate in The Pub Club experience whenever he is in town. Last, at the end of the Spring 2016 semester we were excited to host a “Skype mini-conference” with the Weigel lab in Germany. What did Detlef think of his experience as our first Digital Mug Club’r and joining our “Community of Minds”? Check out this tweet sent by @PlantEvolution 3 months after! The initial effort – it takes a Community! Ok, now that I have shown that reality is not just harsh but exciting as well, back to the reality of what it takes to achieve the exciting! Building a “Community of Minds” like The Pub Club takes work and leadership. Before you will get “buy-in” from others, you must show them the potential value. You will have many who will offer opinions on how you should lead, but few who are willing to take on the responsibility of being a leader themselves. A leader must be able to distinguish between those willing to do the work and those just wanting the recognition. Before you begin you must be willing to accept that your group may have no leaders. If this turns out to be the case, can you lead? As you can see from the above posts, I started out not just hunting for “active participants,” but leaders as well. I was not at all confident I could lead this “Great Experiment,” to bring “the conference effect” home. Honestly, there were many times, especially those first few months, when I considered giving up. Thankfully, because of personal support and a deep belief in the “Community of Minds” vision, I went from a reluctant leader to a cheerleader, ambassador and confident leader in my COM. So to those here at MSU both newly arrived and long time members, as well as those I met this summer or have yet to meet, just as “The Pub Club” concept requires leaders willing to work, take responsibility and even be unpopular sometimes to get it started, without such a leader a successful group will deteriorate and disappear. However, as Katie W. wrote, it is worth “it.” What is the “it” again? The work, the frustration, the “siren calls,” the time and even (in my case) the money. Whether or not a “leader” steps forward and commits to The Pub Club “Mission” at MSU or they don’t and it goes away, the benefit I have seen for both the leaders like Katie W. and those who simply participated every week to fill “The Void,” The Pub Club experience will forever make me smile. For those who do choose to take on this endeavor, we will be publishing a series of posts titled “TPC Structure” detailing each component essential for building your own Pub Club to help you along the journey, so stay tuned!